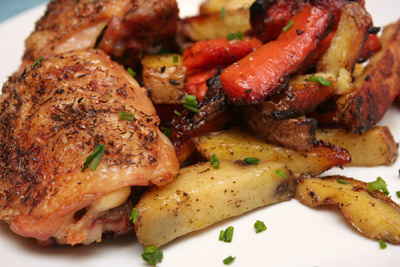 The recipe for “Oven-Roasted Chicken Thighs with Carrots and Yukon Gold Potatoes,” from the March 2009 issue of Bön Appetit, gives what it promises: “the skin gets good and crispy, and the juices make the vegetables extra-succulent.” The magazine’s description was right on. I used 9 chicken thighs, in order to have the suggested 2 1/4 lbs. The cooking process was a kick, where I was able to use a single baking sheet to roast the chicken first (for 35 minutes), then the vegetables (for 35 minutes), then the two together (for 25 minutes), on that same pan. The scent of the potatoes, carrots, and black pepper roasting in the chicken drippings was so warm and delicious. I used 7 carrots to equal the suggested 2 lbs. Chicken thighs, with bone and skin, as they are here, seem to be the most delectable part of the bird. The vegetables roasted perfectly in the bubbling chicken fat; they were sometimes soft and sometimes crispy. The chicken skin was crispy and the meat was moist. The generous amount of spices -- thyme, black pepper, nutmeg -- yielded exquisitely tasty results. I served my delicious dish with a nice side salad. Next time, I will prepare “Shrimp and Scallion Pancakes,” from the April 2009 issue of Gourmet, along with “Sweet-and-Sour Celery,” from the March 2009 issue of Gourmet. Sound interesting? Come back to my site on Friday, September 18, to see what happens with this meal.